This topic contains 26 replies, has 3 voices, and was last updated by Robert 3 years, 6 months ago. After configuring the Tax setting according to your direction I am still getting the same result. Can you please let me know did I make any mistake? 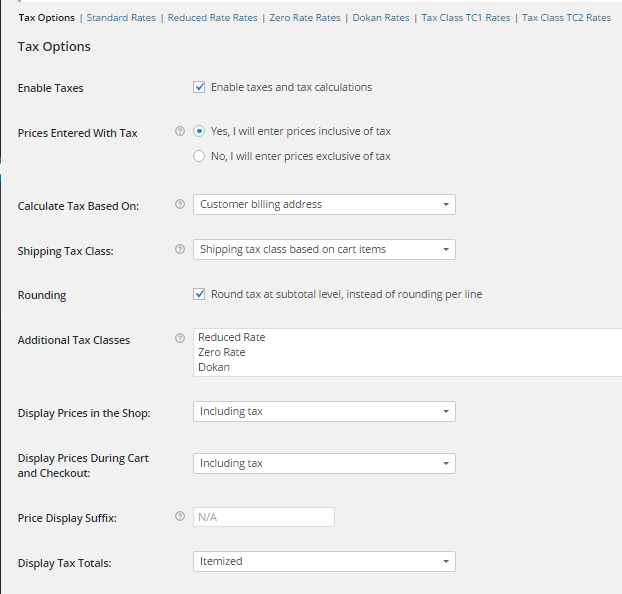 This is Woocommerce Tax Settings Page. Hi, any news regarding this issue? We are now in vacation. Our office will start from 29th September. After opening our office @towhid will check the issue. I have already showed the screenshot of my settings and its output. Can you please let me know did I make any mistake? Hi Towhid, you please need to show me your configured shipping costs of each of these two products for your country, too. Please have a look at this and recalculate it yourself manually. So the combined shipping cost for both products should be £ 7,7.-. If you compare this with your screenshot of your cart, there is a shipping cost of just £ 7,28. So in my opinion it is incorrect in your system, because it should be £ 7.7. (I get a different result in my environment, there it is just £ 5,5.-! So it's incorrect in either way). I am really sorry for my late reply. Could you please share me with your login details. Once I have this I will be able to check the settings you have. Then I will see what I can do for you. Hope to here from you soon. please let me know if you see this error I have outlined in my previous message? If so, you can please try to fix it in your test system and provide an update. Actually I have this case not in my test environment, which I could provide to you. 0.28 BD TAX was wrong at my previous calculation. There are various TAX rate in my system which was applied in the total. 7 is incorrect in your system, because there is no tax of 10% calculated for the shipping cost of Product A. The combined shipping cost has to be 7.5 (and not 7 like in your shipping cart). do you have any news on this issue? The topic ‘Dokan Shipping Tax Calculation incorrect’ is closed to new replies.